Borderlinx | Buy Lenovo and ship worldwide with Borderlinx. Cheap rates guaranteed. Founded in 1984, Lenovo USA is a Chinese technology company that designs, develops, manufactures and sells personal computers, tablets, smartphones, electronic storage devices, IT management software, smart televisions and more. Lenovo USA became very well known in 2005 when the company purchased IBM. In 2013, Lenovo USA became the world's largest personal computer vendor by unit sales. Lenovo USA products work with Windows. Lenovo USA's principle clientele are both professional and private consumers. Lenovo USA's slogan "for those who do" illustrates Lenovo's commitment to creativity thanks to the use of technology. Lenovo USA believes in creating technology that allows people to bring their ideas to life. Lenovo USA makes highly innovative products at competitive prices. Since 2013, all of Lenovo USA Smartphones use the Android operating system from Google. Lenovo USA Tablets include Android as well as Windows tablets and come in many different sizes for different uses. The Lenovo USA Yoga Tablet, one of Lenovo's best sellers, has a unique design that is comfortable to use and has exceptionally long battery life. And, the Yoga tablet starts at just $219. Lenovo USA Electronics also include servers, storage devices, printers, and IT management software to equip entire offices with highly innovative technology. 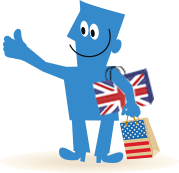 Shop Lenovo in the USA and ship to your home country with Borderlinx. You pay cheap international shipping, tax & duties upfront, which you can calculate using our shipping cost calculator. A number of services are available through Borderlinx to make international ordering from Lenovo USA hassle-free, including concierge, free repacking and consolidation services.